Did you know that one in seven Americans has kidney disease? Someone in your family may have it. And you wouldn’t necessarily know… because there’s a very good chance they don’t even know yet. 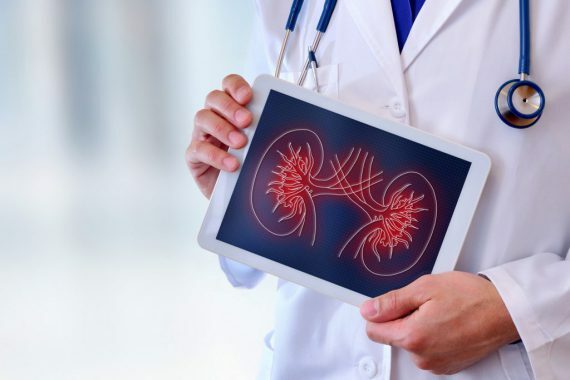 I was surprised to learn that, according to the National Kidney Foundation, an astounding number of people are walking around with undiagnosed kidney disease. Even though I’m so focused on heart health because heart disease runs in my family, I wasn’t aware that a very common heart condition is also a leading cause of kidney disease. I’m talking about high blood pressure. That’s right… high blood pressure is the leading causes of kidney disease in the U.S. When you realize this, it makes sense that kidney disease is a growing threat for Americans since 1 in every 3 adults in the United States has high blood pressure. As I just mentioned, high blood pressure is the leading cause of kidney disease. Over 28 percent of new cases of kidney failure are caused by high blood pressure. A rise in your blood pressure increases the stress on your kidneys. It makes sense then that optimizing your blood pressure is key to preventing kidney disease. Your target blood pressure is less than 130/85, unless you have diabetes or protein in your urine in which case it’s 125/75. To improve your blood pressure, add in regular exercise, cut back on caffeine, alcohol and sodium in your diet, watch your stress levels, eat more potassium-rich foods (like avocados, sweet potatoes and bananas) and work to drop any excess pounds. • Vitamin K2 — This vitamin promotes healthy blood flow and blood pressure by helping to keep your arteries clear, elastic and pliable. • Grape seed extract — Packed with heart-healthy polyphenols, grape seed extract activates nitric oxide in the lining of your blood vessels to relax your arteries and promote a healthy blood pressure. • Pterostilbene — Found in blueberries, pterostilbene is a powerful antioxidant that helps block the creation of Angiotensin II — an enzyme that stiffens the walls of blood vessels. • Green tea extract — The phytochemicals in green tea have been proven to reduce oxidative stress and soothe inflammation and support your cardiovascular health. Researchers at the Johns Hopkins Bloomberg School of Public Health have discovered that a high consumption of sweetened fruit drinks, soda and flavored and sweetened water is associated with a higher likelihood of developing chronic kidney disease. In fact, they found that participants who drank the most of these types of beverages were 61 percent more likely to develop kidney disease than those who drank the least. So, if you want to avoid kidney disease, you should also avoid sugary and sweetened drinks, including flavored waters. Cutting down on sugars will also make you less likely to develop type 2 diabetes, the second leading cause of kidney disease behind high blood pressure. Overusing pain killers can damage your kidneys, leading to chronic kidney disease. Take these only according to directions. If you already have other risk factors for kidney disease, talk to your doctor before using. The contrast dye used in some medical imaging tests can also cause harm to your kidneys. If your doctor orders one of these exams, be sure to ask whether it’s the only way to reach a diagnosis or if a plain film X-ray or ultrasound would be sufficient. If you must receive the dye, be sure to drink plenty of water both before and after the test to help your kidneys flush out the contrast as quickly as possible. You can also take n-acetylcysteine, an antioxidant that has been shown to protect the kidneys from contrast dye damage, for two days before the exam. Chronic kidney disease is the ninth leading cause of death in the United States. Don’t become another statistic. Protect your kidney function with the tips above.